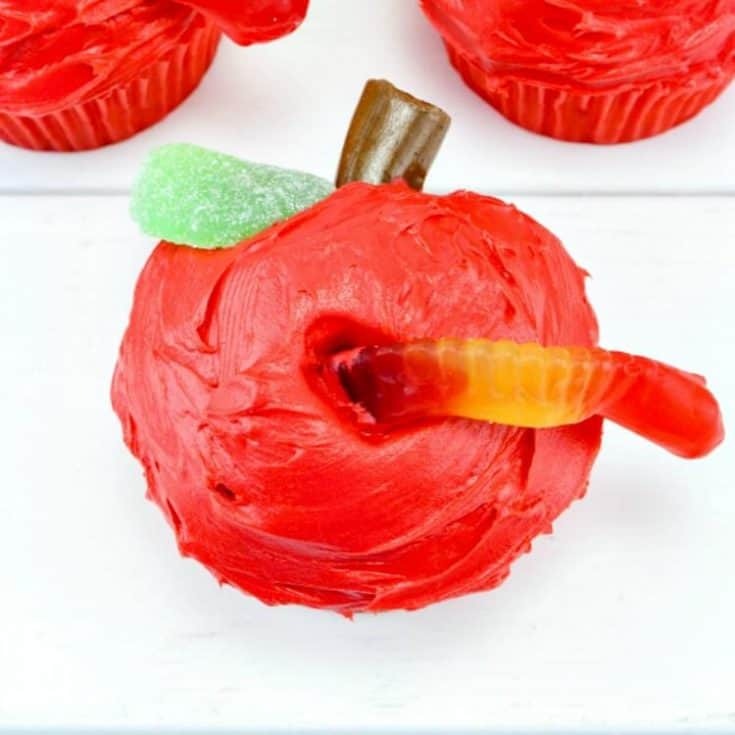 These adorable apple cupcakes with worms are perfect for back to school, teacher appreciation, or a fall celebration. And they’re quick and easy to put together, too! It appears I have produced a child who is a fan of gummy candy. No matter the shape, size, or flavor, if given the choice my girl will always go for a gummy. Is this something they grow out of? Because there are just too many unbelievable chocolatiers in the world. 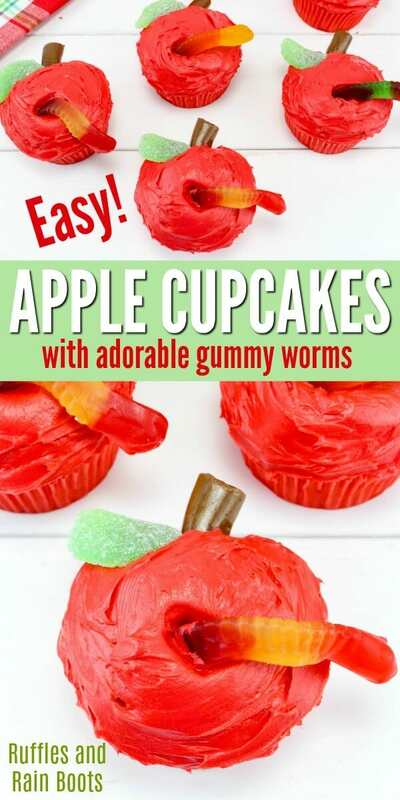 But at least the gummies are adorable in these apple cupcakes. And you honestly wouldn’t believe how easy they are to put together. Here on Ruffles and Rain Boots, we share all thing crafty. And easy. These back to school cupcakes are so stinking cute and can work for back to school, teacher appreciation, and even a new teacher’s graduation party! As one busy parent to another, there is no way I’m going to tell you that you have to start with a homemade cupcake. Nope. Because we’re busy (and no one will know). 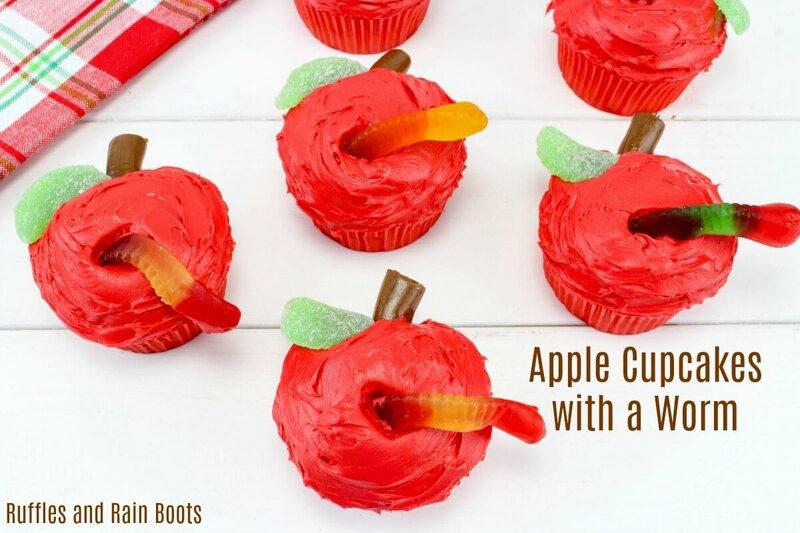 Tasty Tidbit: If you happen to be making these from scratch-o-la, do this for a dent in the top of the ‘apple.’ After you’ve put the batter into the liners, roll up a bit of foil and place it between the liner and the edge of the cupcake pan. If you’re not making these from scratch, just push your finger up against the side of the cupcake for a few seconds. Instant dent. Frost the tasty mini cakes with a generous amount of frosting. Make it “smooth-ish.” We’re not going for perfection here, friends. 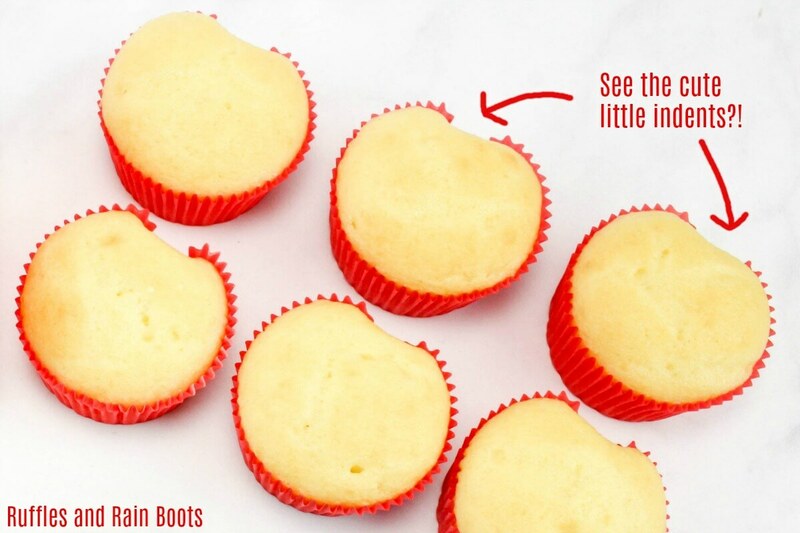 Make the stems by cutting the tootsie’s in half and sticking them into the top of the cupcake (above the liner). If you soften them up a bit, you can bend them like a little stem. It’s all in the details, folks. Cut the fruit slice in half and place it somewhere near the stem. 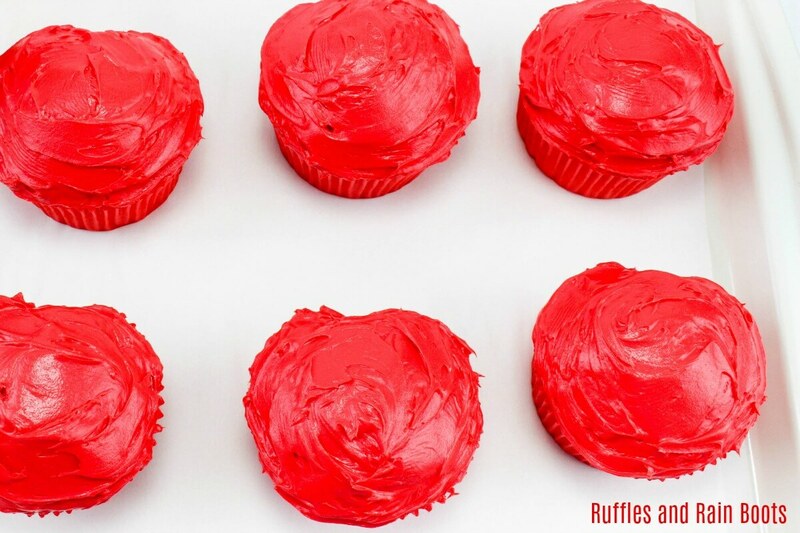 Ish – these are cupcakes, precise measurements aren’t really needed. Grab a gummy worm and cut off one-fourth of its chewy little body. Hand it to your child to nosh on. Use something to make a small hole through the icing and top of the cake and insert the end of the candy. 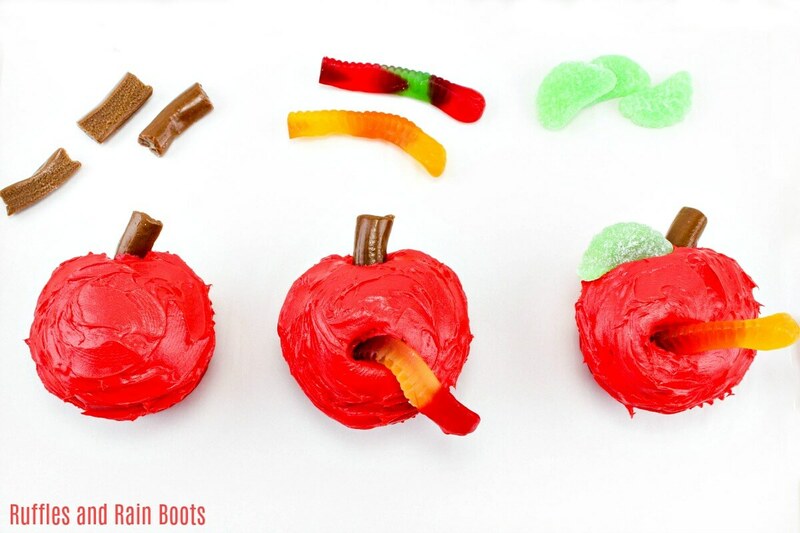 Be sure to let a bit of the gummy worm hang out of these adorable apple cupcakes! Weren’t these the cuties just the easiest things ever? 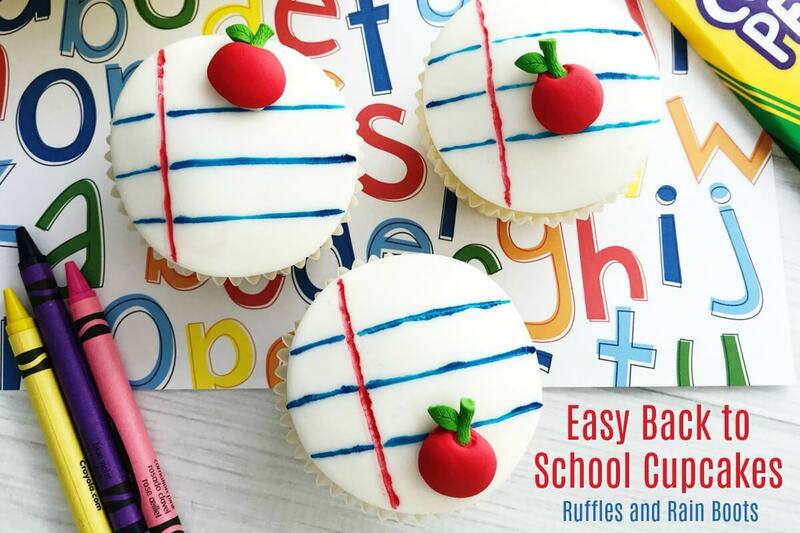 If you like working with fondant, check out our other back to school cupcakes here.